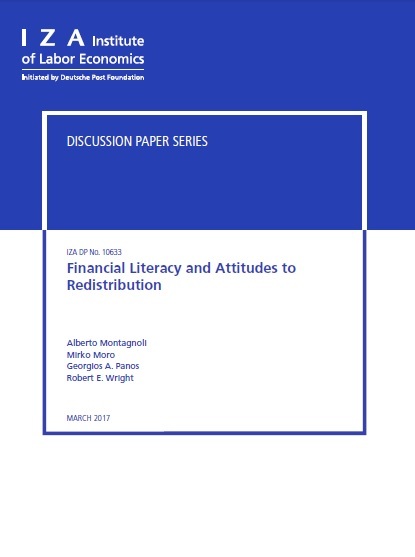 Prof. Georgios Panos (University of Glasgow) and his co-authors, Dr. Alberto Montagnoli (University of Sheffield), Dr. Mirko Moro (University of Stirling) and Prof. Robert Wright (University of Strathclyde) examine the relationship between financial literacy and attitudes to redistribution using novel data on Great Britain. This study combines novel financial-literacy data with measures of attitudes to redistribution from the British Election Study. They find a significant negative relationship between financial literacy and attitudes in favour of government intervention for income redistribution. The effect is robust to several specifications, samples, longitudinal models and instrumental variable regressions. Falsification tests show that these results are independent of generic attitudes towards other types of inequality/discrimination, e.g. based on gender, race or sexual orientation. An inquiry into the mechanisms of the effect indicates that the homo oeconomicus effect does not exert an impact on attitudes to redistribution for the less financially literate. The study contributes to the economics literature by presenting preliminary evidence that the homo oeconomicus effect is more likely to prevail for the more financial literate individuals, while it vanishes for their financially-illiterate counterparts. With most economic models relying on the premise of rational agents, any cognitive skills that are likely to induce such behaviour, such as financial literacy, are likely to be conducive to the validity and predictive power of these economic models. It contributes to the literature on public economics, by presenting one additional main channel to those proposed in the literature on the formation of public attitudes, namely financial literacy. It contributes to the literature on education economics. Its findings may potentially be taken into account when designing policy interventions, by including elements on economics of inequality with the objective to provide a broader view on the subject. 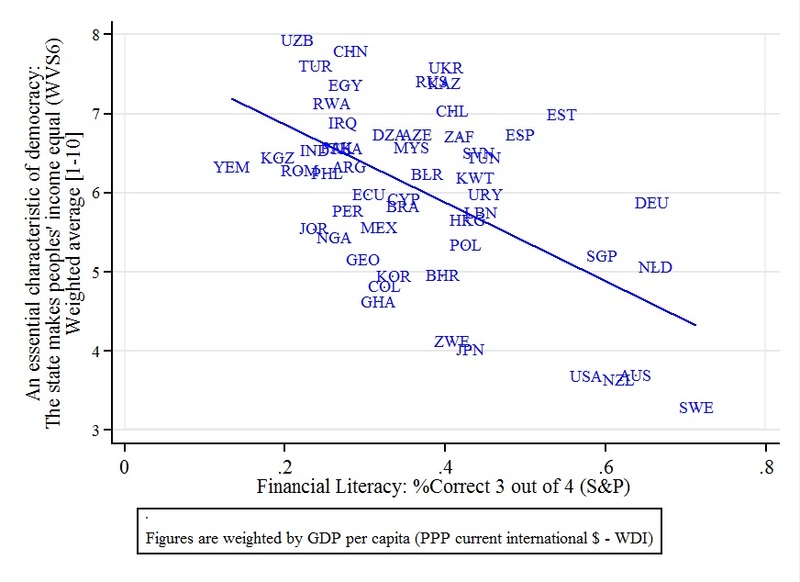 Finally, from a socioeconomics perspective, efforts to improve financial literacy can be seen as conducive to the processes of social constructivism and open democracy. The study was presented at the DynIper conference on the dynamics of inequality, the IMAEF 2016 conference, and the Financial Management Association 2016 conference. The paper has been released as IZA Discussion Paper No. 10633, by the Institute for the Study of Labor in Germany. It is also available as a working paper at the University of Glasgow, the University of Strathclyde, the University of Sheffield and the Centre for Responsible Banking and Finance at the University of St. Andrews.